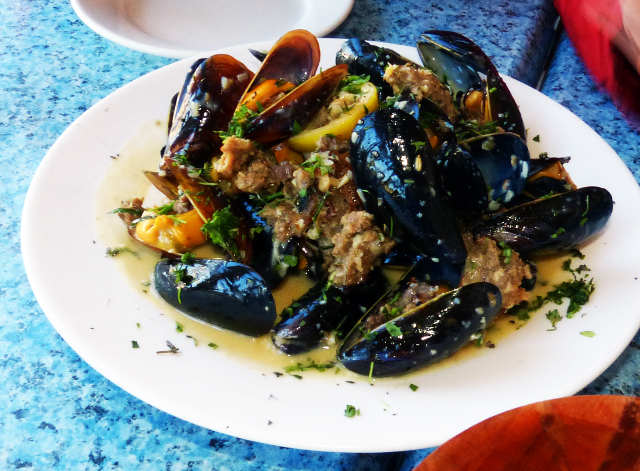 An unusual and enjoyable preparation of mussels. Monkfish served with roasted tomato and garnish over lobster mashed potato. The seafood risotto was a mushy mess. 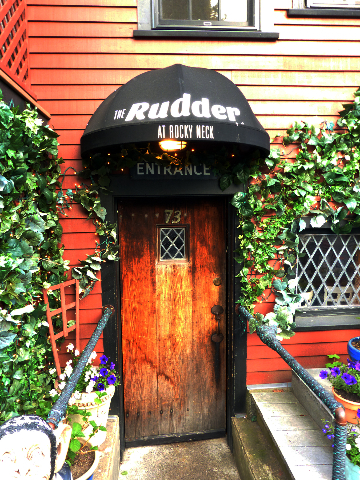 After a Sunday matinee at Gloucester Stage it was around five when our party of five arrived at the popular restaurant The Rudder which had opened at 4 PM. We were fortunate to find parking as well as seating on the porch. Both are hard to come by. Rocky Neck, which is defined as an artists colony, has a narrow road around it which is generally thick with pedestrians. The area with a view of Gloucester's inner harbor is a popular destination. 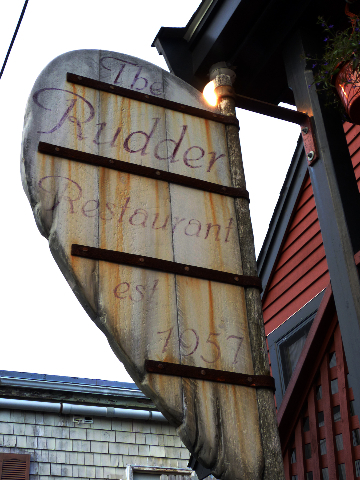 The primary dining destinations are The Rudder and near it The Studio which are both under the same management. The Studio is cozy for hanging out with cocktails and making an evening of it. Since we visited in the cusp of Memorial Day, while enjoying magnificent weather and ambiance, we were pleased to learn that the early bird, off season menu was half price. That made it more inviting to explore the ambitious menu. Being in Gloucester we opted for versions of seafood. One of us, a vegetarian, was pleased that there was a viable item on the menu. The perky and efficient wait staff also informed us of gluten free options. For starters two of us shared Rudder Mussels ($15). It was an awesome Asian fusion version with a creamy wine and fennel sauce with a generous portion of mussels combined with sausage. Not surprisingly, after we raved about them, our waitress commented that they are her favorite item on the menu. Other enticing appetizers include Mediterranean Calamari ($14) fried and tossed with a piquant sauce. The Eggplant Napoleon ($14) is also a favorite of diners. Two of us ordered the Monkfish ($27). 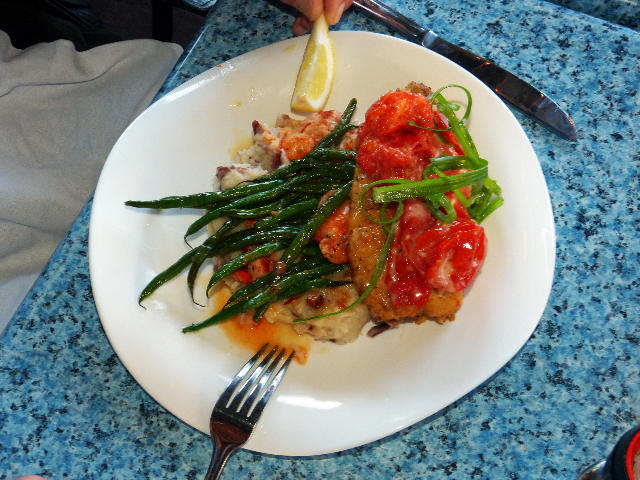 It is a generous portion of fresh fish over a mound of lobster infused mashed potato. The dish was topped with roasted tomato, green beans and a wedge of lemon. Both diners were pleased with their meal. 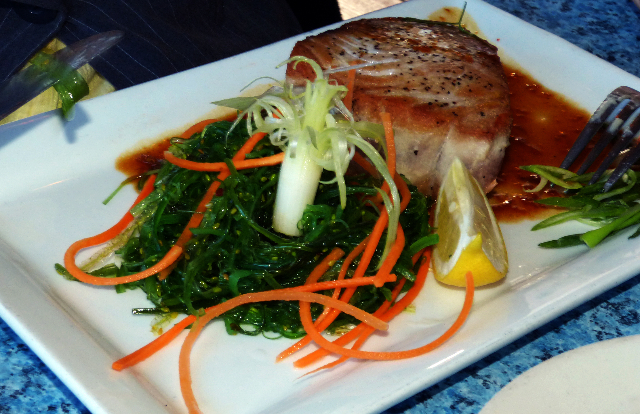 Tuna Steak ($26) was another winning item. It was perfectly grilled and served with wilted seaweed and a vegetable garnish. 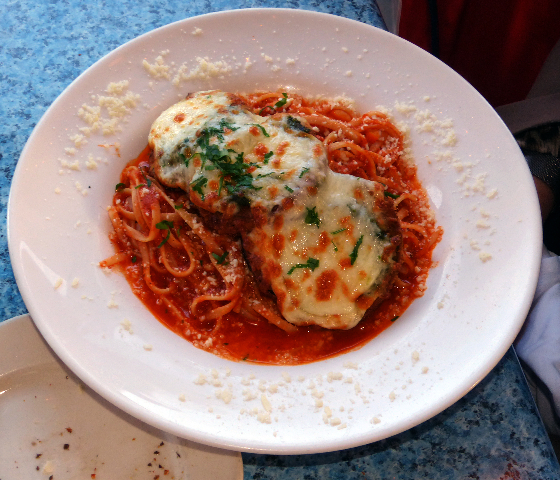 While Eggplant Parmesan over pasta ($17) is not an adventurous dish it was superbly prepared. Half of the generous serving was packed as takeout but didn't last long. 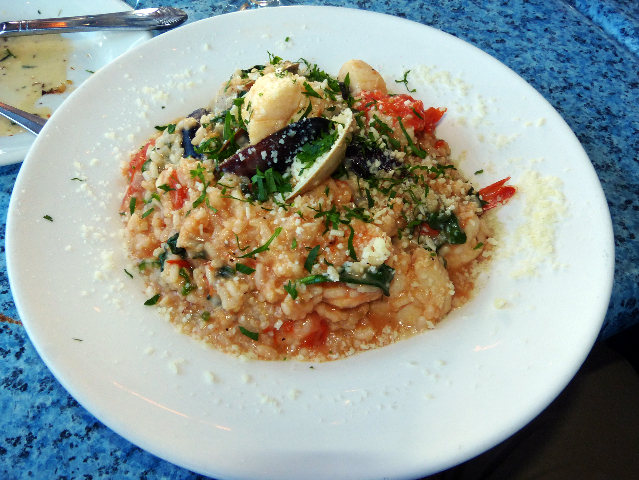 The one disappointment of our visit was Seafood Risotto ($28). It combined mussels, shrimp, scallops and clams. The aborio rice was dreadfully overcooked. This is a dish which must be prepared with attention to detail. It is surprising that this serving made it at the pass. An attentive chef would have demanded a refire. It was so disappointing that half of it was left unconsumed. The risotto was a mess which is not to say that it is a bad dish and might be enjoyable on another night. Overall this was a terrific dining experience and testament as to why the restaurant has been a landmark since the 1950s.